How do you put together a high-powered team, with members from different companies, who have complementary expertise and can blue-sky an innovative plan designed to boost Africa’s emerging economy? A group of seven students in NYU Stern’s Master’s in Risk Management (MSRM) program joined forces to develop the plan for their capstone project. 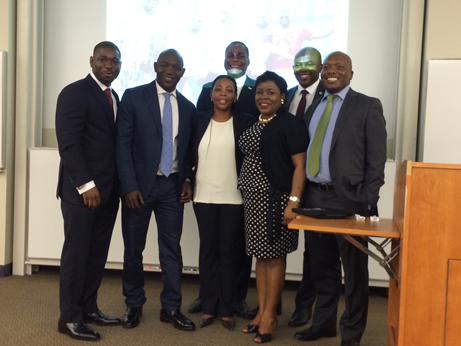 The group members spanned multiple countries and time zones and averaged about 15 years of multinational work experience in risk management, corporate and investment banking, corporate finance, financial and industry consulting, and compliance: Aliyu Ahmed, a Bank of America assistant vice-president from Nigeria, based in Los Angeles; Eneni Oduwole, a veteran risk management executive from Nigeria; Gerald Mudzamiri, a Zimbabwean working in Toronto and Dubai as an independent consultant in business transformation and risk management; William Adjovu, a Ghanaian native who is currently CEO of the Liberty Group of Companies in Ghana; Omoatama Isenalumhe, a Nigerian operations and compliance manager based in New York; Mokgadi Magoro, a South African treasury analyst responsible for asset and liability management at the Barclays Africa Group in Johannesburg; and Augustine Emeka Uzoh, a Nigerian credit risk manager with Diamond Bank plc in Nigeria. The team divided up tasks based on areas of expertise and access to information, and the entire project was organized into three phases. Included were a rationale for SWFs and review of existing best global practices, a survey of the regulatory and legal landscape, and an intensive investigation into the applicability of the SWF framework in Africa. MSRM faculty assigned NYU Economics Professor Yaw Nyarko, a leading Ghanaian economist, to provide feedback along the way. Given the continent’s challenges with recursive and unstable growth, the team undertook a deliberate review of the counterproductive factors that have impeded Africa’s progress, including poor infrastructure and outdated technology, corruption and poor governance, lingering civil disturbances, a weak educational system and a dearth of skilled professionals. “Given this complex outlook, it is crucial that a fit-for-purpose framework is developed and implemented by African countries to ensure that issues of strong governance and effective risk management are adequately addressed and processes required clearly defined,” says William. Emeka expresses the group’s cautiously bullish outlook: “We are positive that the gains accruable from Africa’s immeasurable natural resources can be plowed back into the development and growth of socioeconomic structures of these countries, if an appropriate and well-managed savings and investment system such as an SWF exists,” he says. For this talented group, that would be a dream come true.